I know that many people are worried about the amount of power being consumed by electronic devices which are in stand-by mode and not actually doing anything useful. For example this article from the Economist magazine suggests that devices on stand-by could be consuming either 5% or 10% of total domestic electric demand (depending upon what part of the article you believe). I recently found out about the One Watt initiative which aims to ensure that in future all devices will be legally obliged to consume a maximum of 1 watt each while on stand-by. The current cost meter that I have installed in my home provides me with an indication of the lowest power consumption rate each day. This figure is normally around 140-150 watts. Presumably this rate is reached when all of the household is asleep and not actively using any of the many devices we have in the house. My total power consumption varies from day to day, but on a normal day this background usage level would account for roughly 20% of my total consumption. Not all of the devices consuming power could or should be switched off at night e.g. it would not be a good idea to unplug the fridge/freezer before going to bed each night. However, I am sure that we should be able to reduce this figure significantly. 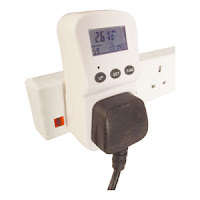 In order to identify which devices are consuming power at night, I would need to take measurements of the consumption of the various devices left on at night. The amount of power that each device consumes would probably be quite small and so the current cost meter (which only measures to the nearest watt) is probably not accurate enough. So I bought a plug in energy monitor from Maplins. which was capable of monitoring to an accuracy of 0.1 watts. The display has no back light and so it cannot be read unless I have a bright light shining on it. However, I can understand this since they don't want the device itself consuming too much power. And in any case, the use of a flash-light can overcome this problem. The digits on the display are so small that they are barely legible. The unit has a number of different modes. In each mode one measurement is displayed in large digits, a secondary measurement is displayed in smaller digits an unfortunately I can only guess what value us being displayed. It also uses an even smaller symbol to indicate what mode it is in an this sysmbol is so small that I have no hope of even guessing what it us. However, I have developed a little trick to work around this problem - the voltage reading will always be close to 240 and it would be very bad luck if any other measurement gave a similar reading. If I cycle through the modes until I see a reading close to 240, then I can use the manual to see how many more times I have to switch through modes to get to the mode I want. It is a pity that a great device should be ruined by such a simple defect. When I complete my measurements with this new device I hope to be able to report back here on which devices I was able to switch off and how much electricity I saved.